The MacKinnon Ice Horse Ice Wraps are top-quality insulated cannon bone/tendon leg wraps that stay cold for up to two hours of convenient and thorough cooling of the tendons, ligaments, muscles and connective tissue. 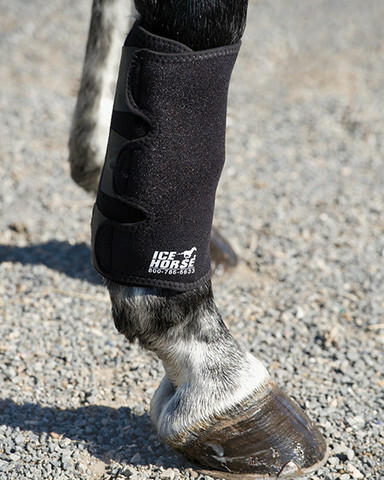 The unique design both conforms to the horse's leg and provides optimum compression, assisting the cold penetration of inflamed soft tissue. After just three hours in the freezer, they're ready to use again. Because there are also times when heat therapy is called for, these wraps can just as easily be used for targeted heat application. Ice Horse Tendon Wraps utilize a patented Propylene Glycol formula which is food grade for quality assurance and non-toxic properties. Durable and easy to use these are an excellent alternative to cold water hosing. Comes with two tendon wraps and 4 re-freezable/heatable inserts.